I started my journey a decade ago and I must say that working as a headteacher at my school is the best thing that has happened to me. To begin with, my day starts at 4:00 am and I finish doing the household chores by 6 am. An hour goes on guiding my 10 year old daughter with her homework. By 8:00 am, I am at the school. 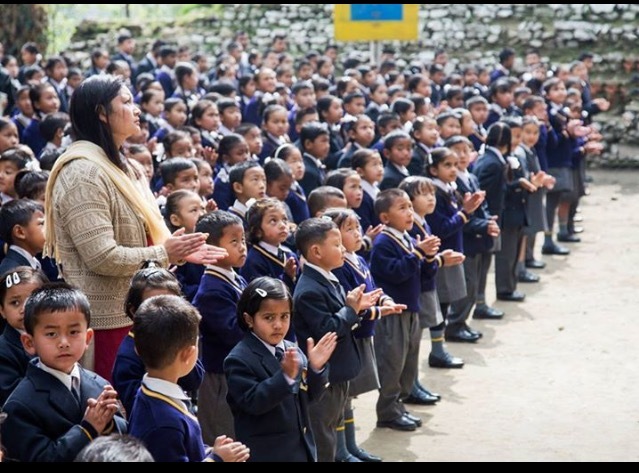 I lead the morning assembly every day and address the students, teachers and the parents. I am known to be strict and I make sure that the students reach school on time, smartly dressed and greet their teachers and parents every morning. My job requires me to be tough and soft at the same time. Maintaining disciple and making sure that every child is learning and growing at the same time is my priority. Safety and making sure that everyone is treated at par is what I firmly believe in. Of course, as the Head Teacher I do face a lot of challenges at times. Making sure that everything runs smoothly at school is my priority. Addressing and helping teachers when they need my help and handling teenage students who sometimes become rebellious at home. Over the years I have managed to be friends with the students and teach them why discipline, endurance and being positive is important in life. It feels great when parents meet me and thank me for promoting the right values. Balancing home and work is not easy, but over the years I have mastered it. I make sure I spend time with my daughter and also spent time cooking for my family. After school I mostly guide students and answer their queries. I follow an open door policy, so anyone can come and talk to me directly. I also focus on teaching girl students about hygiene and being healthy. Most of the students are from villages, so they go home and teach their mothers about what I teach them. I also train them on public speaking during weekends. I am a trained dancer, so I also encourage them to dance during the weekends. My aim is to make them confident, build endurance and teach them values in life. The focus is also on encouraging students to take up their hobbies seriously (we have a girls football team in school, arts and crafts, dancing classes, volley ball classes and many more). Yes I am a head strong woman who believes in giving it back to the society! I am an active guest speaker at various forums in the village, I also teach English to non teaching staff at school. It is an amazing, priceless feeling to see them speaking in English with a lot of confidence. I am fortunate that the entire managing committee of the school, teachers, students and the parents believe in me. I am looking forward to spending another exciting decade at school.